Warmblood Stallions of North America News Blog: Win Tickets to Dressage at Devon 2018! Win Tickets to Dressage at Devon 2018! Warmblood Stallions of North America is offering you a chance to win a pair of tickets to Dressage at Devon 2018! The show will be held this year from September 25th through the 30th. You must enter by August 26! A huge attraction for breeders, Dressage at Devon presents the largest open breed show in the world, spanning three days and including a full range of classes. It's a fabulous place to watch the quality of the youngest generation of horses, from fabulous foals to stunning young stallion prospects. The Breed Division of the show is held the first three days, Tuesday, Wednesday, and Thursday. The Performance Division follows Friday through Sunday, and typically draws some of the finest dressage competitors in North American dressage. 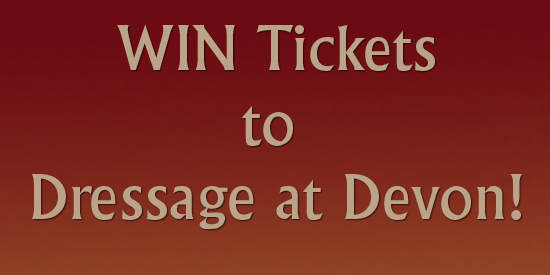 Enter now to win tickets to Dressage at Devon! Each winner will receive two tickets - a $120 value - which are for general admission on all six days (all other expenses and arrangements are the responsibility of the winner). Contest closes on August 26, 2018, and winners notified August 27. Copyright Anna Goebel, Warmblood Stallions of North America. Awesome Inc. theme. Powered by Blogger.